Today The Boy's Behaviour is featured over on Life With Katie - a great blog by adoptive mum Gem about her adoption and making a Forever Family, and how two became three, and now hope to become four. 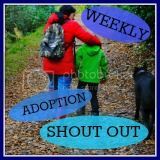 I was asked to write a guest post for Life With Katie to help celebrate National Adoption Week 2012. Please do pop over there to read about our own positive story.